The plan for the massive redevelopment of LeBreton Flats, including a new NHL arena, is in danger of failing over a disagreement between the key members of the group awarded the major project. The Ottawa Senators and Trinity Group — the key partners in RendezVous LeBreton Group — told the National Capital Commission earlier this month they have "not been able to resolve their internal partnership issues," NCC board members heard during a public meeting Thursday. What, exactly, is at the root of those differences was not publicly discussed. However, RendezVous LeBreton was supposed to have formalized some aspects of its partnership by Nov. 1. Even with an additional week's time, they were unable to come to an agreement. The board gave RendezVous LeBreton until its next meeting in late January to resolve its differences, or it will begin a new process to develop a plan for the 20 hectares of federal land just west of the downtown core. Ottawa Mayor Jim Watson, a non-voting member of the NCC board, said he was disappointed by the latest development, but did not seem particularly surprised by the fact that Senators owner Eugene Melnyk and Trinity executive chairman John Ruddy are having issues. "It has been a challenging relationship that I have witnessed," Watson said in response to a reporter's question about the rapport between the two RendezVous LeBreton partners. "They have to get their act together, plain and simple, otherwise I think we're going to have to move on in January." Earlier this year, the NCC struck a deal in principle with RendezVous LeBreton to build a new NHL arena, an accessible community centre, 4,000 units of housing, a French-language public school and public space. The area will served by two LRT stations, Pimisi and Bayview. At that time the project was valued at about $4 billion. NCC CEO Mark Kristmanson told the board and reporters that both the NCC and the city had completed their work, including a study to determine the level of contamination on LeBreton Flats. The city was working on rezoning the area and planning for public amenities, but Watson said all that's now on hold. Kristmanson also said the rotating leadership of RendezVous LeBreton, particularly at the top of the Senators organization, has been a challenge. "There's been a changing cast of characters in this project from the beginning," Kristmanson said, starting with former Sens president Cyril Leeder, "who we admire and who was a great leader," followed by Tom Anselmi, who also left the Senators. 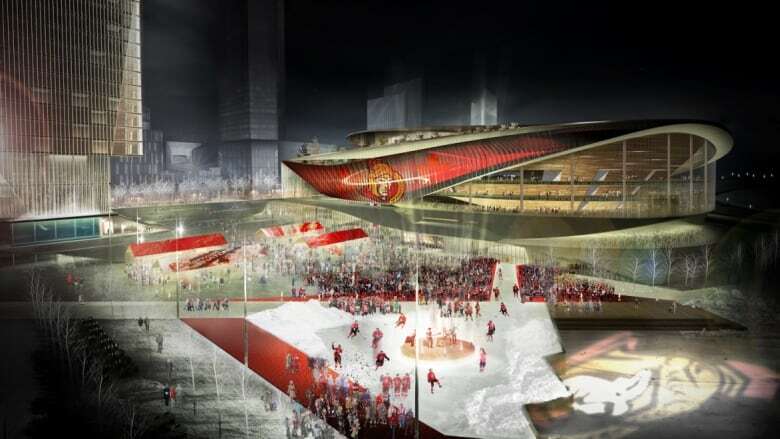 Melnyk released a brief statement Thursday afternoon saying RendezVous LeBreton remained committed to the project. "We've championed a downtown sports and entertainment arena, and this important civic project, since initiating our proposal in 2014. We continue to be committed to making our vision a reality," he said. In a separate statement, Ruddy said Trinity remains "committed to the redevelopment of LeBreton Flats" and "determined to work towards the right solution." It's unclear exactly what happens next, although sources with knowledge of the negotiations say it's unlikely the RendezVous LeBreton partners will come to an agreement in within two months. The group could possibly reformulate itself with a new partner, said Kristmanson, although no one could say Thursday what that process might look like. The NCC CEO said there's "an enormous amount of vested knowledge" in the project, and he's adamant there be some plan for LeBreton in the future. "We've had four teams working on it, we know the exact state of contamination, we know the servicing requirements, we know the impact of the LRT, we've advanced discussions with the Algonquin First Nations to a high degree, with the building trades," Kristmanson said. "There's a great anticipation of this project. So if it turns out that this group can't do it, we're going to move on to a new solution and new ideas for how to bring this very important area back to life as a community in the capital."